This 42eXplore project contains links to website resources for twenty-eight separate 'talking walls' introduced in the books of Margy Burns Knight and Anne Sibley O'Brien. Easier - Walls are structures that divide, surround, or protect an area. Do walls talk? If they could, what might they tell us? 'Talking walls' is an idea or theme that was added to literature by writer Margy Burns Knight and illustrator Anne Sibley O'Brien. In their books, they introduce different cultures of the world by examining walls, the people who built them, and their impact on the community. Harder - Walls do tell a story about the history, politics, and culture of their community. They explain something about the people who built them. They also give a sense of the times in which they were built. The people and community where they are located are divided or unified by them. Margy Burns Knight and Anne Sibley O'Brien have authored Talking Walls (1992) and Talking Walls: The Stories Continue (1996) plus a Talking Walls Teacher's Guide.(1992). Investigate walls that have been constructed and created by man; their historical, cultural, and political significance. Here you find a collection of the paintings by Anne Sibley OBrien. Analyze the 'Talking Walls'. Evaluate the talking walls sites. Which is your favorite? Explain why you chose it. Which walls should be torn down? Use spreadsheet or Inspiration software to show what you already knew and what new insights you gained form the 'Talking Walls' books and/or the websites. Add A Missing 'Talking Wall'. There are other talking walls. What other wall would you add? Make a presentation that informs and convinces others of the importance of your wall. Visit the Wall. Maybe you can't visit one of these famous walls, but can you take a virtual visit? Many of the websites below contain virtual visits through video, audio, and animation. Pretend you are someone visiting the wall. Create a character and write about why they might be visiting this particular wall and what they plan to do on their visit. Compare Walls. Learn about one of these famous walls. Compare your wall with others. How are they alike and different? How does your wall reflect the social, political, or cultural aspects of the place it is located? Create a Wall Poem. Create a poem that describes the feelings you have after learning about one of the walls. Write a paragraph that describes the wall and how you got your ideas for the poem. Post it on a class poem wall or create a poem wall web page. Identify the Walls in Your Community. Examine your neighborhood to find the existing walls. Remember, talking walls are political, cultural, and historical. Some walls are relatively short-lived, others last for hundreds or even thousands of years. Look all the walls in your community. Should any of the walls be eliminated? Create a multimedia presentation about your community's walls and their impact. Create a "Talking Walls' Poster. Inform others of your favorite wall by creating a poster about it. Display your completed work. Have You Built Any Walls? Write in your journal about walls that you have helped to build. Remember walls can be actual physical constructions of stone, wood, metal, and concrete - - or they can be walls in our minds. Write about the walls that you have built. For more ideas, check out the Talking Walls Teacher's Guide by Margy Burns Knight and Thomas V. Chan. This website is a history project on the discovery of the ancient cave and its paintings. This site presents the Deltaworks--a system involving locks, sluices, channels, and other control methods to prevent flooding. Many people in the Netherlands believe it is the eighth wonder of the world. The site provides the background of this project and explains how it was started because of a catastrophic flood on January 31, 1953. The walls built by Pilgrims. This site provides an overview of the physics, science, and architectural construction involved in the construction of the Wall. This multiage student project created a visual and written work of art that teaches others about the lives of people who have inspired us and in various ways connected us with the greater human conscience. This site houses a collection of web-links for Aborigine history and culture. In 1905, construction of an Immigration Station began in China Cove. Surrounded by public controversy from its inception, the station was finally put into operation in 1910. Anticipated as the 'Ellis Island of the West', it was designed to handle a flood of European immigrants who were expected to begin arriving in California once the Panama Canal was opened. This comprehensive website on the history of the Berlin Wall contains photographs and texts. 5) Berlin Wall Interactive from Discovery Communications, Inc.
Bonampak is a Classic Period Maya site, located in the modern state of Chiapas, along the Usumacinta River. It is most notable for the magnificent murals. The new home for the Museum opened on June 29, 1989, on a 9.6- hectare (24-acre) site on the Quebec bank of the Ottawa River. The building is approximately 100,000 square meters (1,076,430 sq. ft.) and comprises two distinct structures. On 12 September 1940, four teenagers in the Dordogne region of southwest France were out looking for their dog. As they searched through the undergrowth, they stumbled across the Lascaux Cave adorned with some of the most extraordinary prehistoric paintings ever discovered. Fez is one of the worlds oldest continuously inhabited cities, dating back to the early ninth century. Explore the city of Cuzco, which in the 15th century became the powerful capital of an expanding Inca empire. Diego Rivera (1886-1957) was one of Mexico's most important painters and a major artist of the twentieth century. Learn about this November Hindu celebration. Here you find a huge links collection to online resources on the Great Wall of China. The city of Great Zimbabwe is located in the present day country of Zimbabwe, east of the Kalahari desert between the Zambezi and Limpopo rivers. The Wall was built by order of the Roman Emperor Hadrian, probably given during his visit to Britain in AD 122. Over the next six years professional soldiers, legionaries, built a wall 80 Roman miles long (117 km or 73 modern miles). The Holy Mosque in Makkah (Mecca) is the most revered place of worship for Muslims around the world. At the center of the Mosque is the Ka'aba, which literally means 'cube' in Arabic. All Muslims are required to face in the direction of the Ka'aba five times every day when offering their prayers. Here you can see photographs of the magnificent bas relief carvings found at the site of an ancient Indian seaport. Today the art of decorating houses is known throughout Africa. Some think that in early periods, house decorations did exist. But for a period of time, this practice was not tenable and the art of decoration may have been preserved but practiced in some other form--not on houses but perhaps on pottery, until conditions again favored the decoration of houses. Established in 1984 as part of the Anti-Graffiti Network and incorporated in 1996 as part of the Philadelphia Department of Recreation, MAP sees its role as a "public service," bringing art and art education at no charge to communities. Violence has divided Northern Ireland for years. Towns are split into sections. Painted lines, brick walls and barbed wire separate people of Protestant religions from their Irish Catholic enemies. Here you find a biography of the Chilean poet, diplomat, and Marxist, winner of the 1971 Nobel Prize for Literature. This website provides photographs and a summary of Jewish history in Kazimierz, Krakow, Poland. Here you can find two biographies of the South African civil rights leader. 3) Long Walk to Freedom: Autobiography of Nelson Mandela from Time, Inc.
Tibetan prayer wheels (called Mani wheels by the Tibetans) are devices for spreading spiritual blessings and well being. Rolls of thin paper, imprinted with many, many copies of the mantra (prayer) Om Mani Padme Hum, printed in an ancient Indian script or in Tibetan script, are wound around an axle in a protective container, and spun around and around. Loyalty, faithfulness and unconditional love are qualities that have earned dogs the title of 'man's best friend'. One particular Akita dog took these qualities to the extreme; he earned a place in the hearts of all Japanese people and has kept that place for over sixty years! The Pueblo at Taos is one of New Mexico's authentic examples of the survival of Pueblo Indian life, relatively unchanged since 1540 when Coronado saw buildings and customs closely resembling those which can be seen today. Wall: National Vietnam Veterans Memorial in Washington, D.C. This gallery contains pictures and stories of the Vietnam Veterans Memorial. Wat Phra Chetupon, more popularly known as Wat Po, dates from long before Bangkok became the capital, having been founded in the 16th century. The Western Wall is a surviving remnant of the Temple in Jerusalem. Here you find a picture from a live camera and information about the location. Students will compare the characteristics of artworks in various eras and cultures, specifically the primitive cave art of 15,000 b.c. and aboriginal art of Australia. 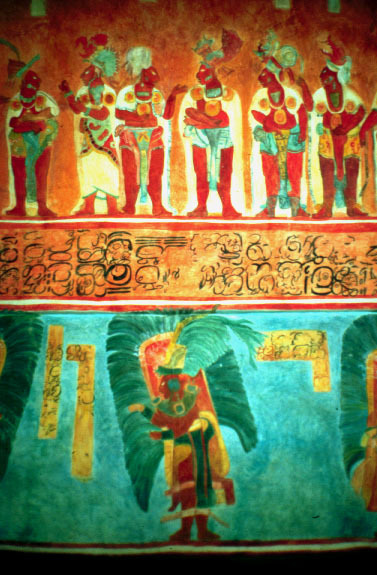 The Bonampak murals are in a delicate condition. After reading the excerpt from Talking Walls on the murals visit the website created on the Bonampak Murals. What can be done to save these murals and others that are in delicate condition? Find lessons and materials showing how teachers in art, history, science, technology and other areas can use the mural. This website provides a sample unit plan for integrating the 'talking walls' concept into the classroom. In this lesson, students will explore how conflict resolution techniques can be used to resolve differences of opinion, both on a global and local scale. This lesson can be taught while the class reads the book Talking Walls by Margy Burns Knight. The lesson is designed as a vehicle for students to make a personal connection to the issue of how we build walls to divide us from others or how walls can bring us together. This lesson focuses on studying countries around the world in conjunction with using the book Talking Walls. Here you find a plan for creating a 'talking wall' unit or project in your school. This exercise helps students understand that xenophobic attitudes have existed throughout United States history and that our culture has survived and been enriched by each new wave of immigrants. Students read and analyze a poem written on the wall of the Angel Island Immigration Station in California by an unknown Chinese immigrant, then research to learn more about the place where the poem was written. Created by Annette Lamb and Larry Johnson, 12/01. Updated 6/02.